Crest Sensi-Stop™ Strips to the Rescue + a Giveaway! One of the first things I notice about a person is their smile. Sometimes a smile doesn't come without pain. Now, I am not talking severe dental pain that needs treatment from a dentist like cavities, root canals or even tooth removal (all of which I have experienced this year); I am talking about tooth sensitivity. Tooth sensitivity is a real condition of which I experience as well. The fine people at Crest have a whole slew of products that help with tooth sensitivty, but none as powerful as their brand new breakthrough product called Crest Sensi-Stop Strips™. 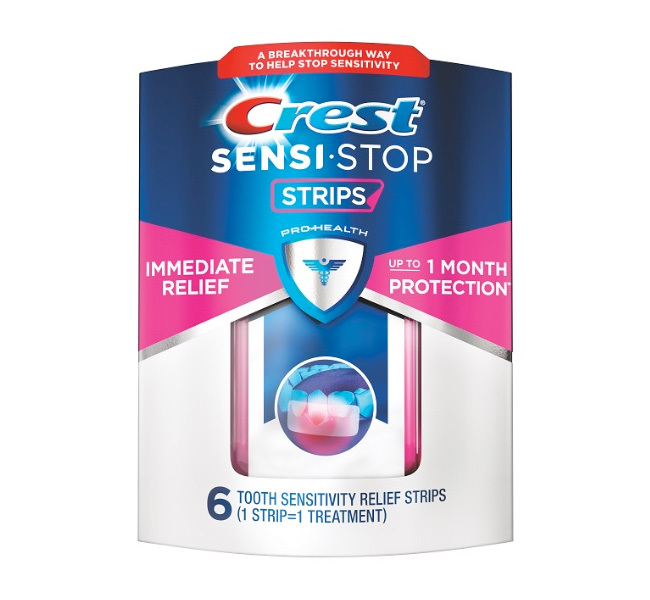 If you have ever experienced a sensitive tooth, you will want to give the new Crest Sensi-Stop Strips™ a try. Crest Sensi-Stop™ Strips are these thin little, flexible strips (like mini tooth whitening strips, if you've ever used those) that contain an active ingredient used by dental professionals. Unlike toothpaste, Crest Sensi-Stop™ Strips are applied directly to sensitive areas so the strips provide targeted delivery of the key ingredient that allows for longer contact time on the surface of the tooth. Within mere minutes, strips build a lasting barrier that helps stop sensitivity pain by blocking tubules. What this does is relieve symptoms of dental sensitivity for up to 30 days (*With the use of similar oxalate products, some patients reported sensitivity relief for periods of up to one month, while others reported relief for shorter periods). On this coming Saturday, September 27th, stop into your favorite Walgreens store for a special Saturdate event. While there pick up a box of Crest Sensi-Stop Strips™ for just $17.99 - such a great deal! Additionally there will be coupons and deals throughout the event and even samples of Crest Sensi-Repair Toothpaste so you can have even better relief. The Crest Sensi-Stop Sweepstakes (the “Sweepstakes”) is intended for participation only in the United States and shall be construed according to, and governed exclusively by, United States law. Do not participate in the Sweepstakes if you are not a legal resident of the United States, physically located in the United States at the time of entry or do not fall within the eligibility requirements set forth in these official rules. PROMOTION DESCRIPTION: The Sweepstakes begins on or about 9/24/2014 at 12:00 a.m. Eastern Standard Time (“EST”) and ends on or about 10/5/2014 at 12:00 a.m. EST (the “Promotion Period”). By participating in the Sweepstakes, each entrant unconditionally accepts and agrees to comply with and abide by these Official Rules and the decisions of Beautiful Makeup Search (“Sponsor”), which shall be final and binding in all respects. Sponsor reserves the right to modify or terminate sweepstakes if conditions arise that compromise its integrity or intended play. ELIGIBILITY: Only legal residents of the fifty (50) United States and the District of Columbia who are eighteen (18) years of age or older and located in the United States and the District of Columbia and Canada at the time of entry are eligible to enter the Sweepstakes. Employees of Sponsor and Sponsor’s advertiser partners and their respective parents, subsidiaries, affiliates, distributors, retailers, sales representatives, advertising and promotion agencies and each of their respective officers, directors and employees (and immediate family members and those persons living in the same household of any such officers, directors and employees) (collectively, the “Promotion Entities”), are ineligible to enter the Sweepstakes or win the prize. Subject to all applicable federal, state and local laws and regulations. Void in, Puerto Rico, all U.S. territories and possessions and overseas military installations, and where prohibited. TO ENTER: Fill out the widget on this page. Winner will be randomly chosen by widget on or about October 6, 2014 and be notified by email left by entrant in the entry widget. Winner has 48 hours to respond or prize will be forfeited. All decisions by the sponsor are final. PRIZE DELIVERY: Sweepstakes prize will be delivered by sponsor within 2 weeks of sweepstakes promotion period ending. Sponsor cannot be held liable for shipment of prize once it leaves our hands if it is not deliver as set forth. Disclosure: This is a sponsored post for which I was compensated and received products for testing. While I was compensated to write a post about Crest® Sensi-Stop™ Strips, all opinions are my own.